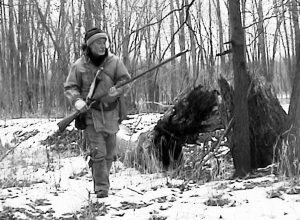 In previous columns I have told of Major S. L. McFadin’s accounts of Kankakee River legends Killbuck, LaBonta and Mingo. In this column I will tell of how McFadin met them. It was about 1841 when one of the McFadin family cows went missing. He described her as a cross-eyed ugly animal, but she gave plenty of milk “sometimes our only salvation in time of need when many a meal did we make off of mush, or corn bread and milk and we were happy.” He feared that “wolves had got her.” McFadin wrote that he “took my gun, tomahawk and dog and started on her track.” McFadin was not going to give up his hunt for the cow even “if it took all winter.” The first night was cold and he needed to “prepare to camp or freeze to death. I found a standing hollow tree big enough to stand up or lay down in; while fixing it with sticks to keep the cold out and getting wood, I heard a noise and looking round saw a deer coming straight for me with tongue out and nearly give out, and two big gray wolves close alter it; as I was very hungry and out of meat I grabbed my gun and shot the deer, that fell dead close by me; but the wolves were ravenous with hunger and disputed the possession of the deer with me, considering it their lawful prize.” The fight was on! With a empty gun he used it to “mash in the skull of one and killed him dead on the spot, but broke the breech of my gun off in doing so.” The other wolf let go of the deer and went after McFadin. The wolf had him by the leg, but fortunately he had his tomahawk in his belt and sunk it in the skull of the wolf. McFadin later said it was the “tightest place I was ever in, in my life.” McFadin got a fire started and roasted some venison. He kept the fire up to ward off any other wolves. He then attached the rest of the venison to the top of a sapling and tied a small piece to his wounded leg. 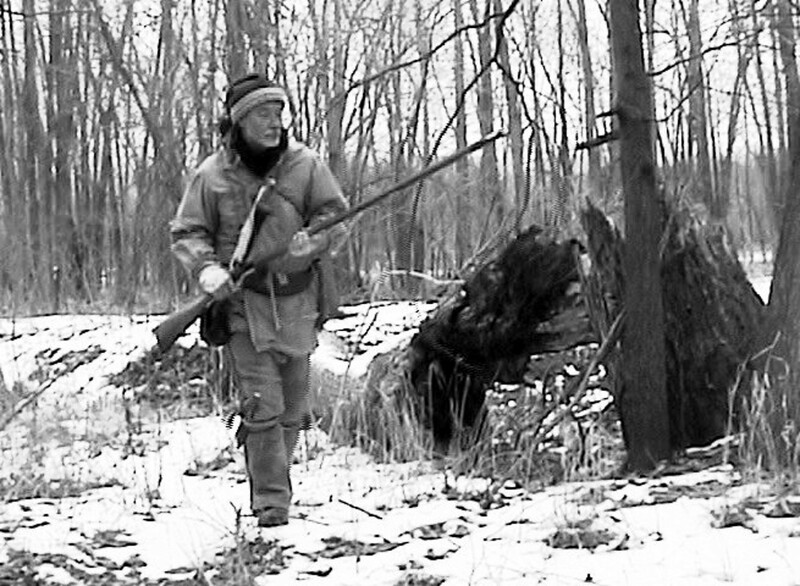 McFadin later wrote “As big wolf hides were worth something those days, I skinned them, and hung the hides up in a safe place and felt as though I was worth a million.” He left the broken gun in the hollow tree and continued to track down the lost cow. Later McFadin came upon an Indian camp. The Indians were out of ammunition and were starving. He gave them the balance of his food. Also, in the camp was Mingo whom he had met before and was already a friend. Mingo joined him in his search for the lost cow. The cow was heading for the Kankakee. They approached the river near where Baum’s Bridge is now located. They decided to camp out the winter at this spot. Their first night on the Kankakee was a cold one. The two had trapped a raccoon the previous day and were roasting it when they heard a nearby shot. They packed up and started out to find who fired the shot. 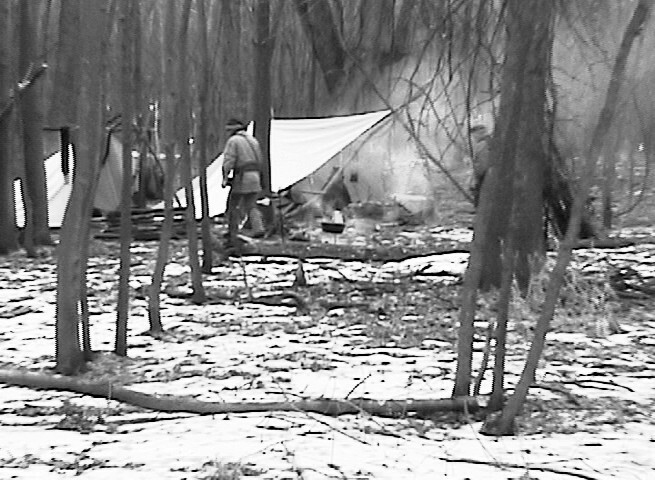 It was but a short distance when they came upon the camp of Killbuck and LaBonta. So began a long and close friendship between the four of them. LaBonta and McFadin later tracked down the lost cow to a salt lick 75 miles from the McFadin home. The cow did not survive the excursion.